When it comes to our prosperity, our freedom tradition, and our constitutional government, President Barack Obama has been the great destroyer—knocking down the free-market economy and principles of limited government that have made America the envy of the world. As New York Times bestselling author David Limbaugh documents in chilling detail in his new book, The Great Destroyer, the Obama administration has waged a relentless, nearly four-year-long war to transform our nation into a country where federal bureaucrats have more power over our lives than we do; where leftist crony capitalism dependent on government subsidies is replacing the real thing; where, in an Orwellian inversion of meaning, a savagely weakened national defense somehow makes us stronger and trillions in deficit spending on counterproductive government “stimulus” and welfare programs somehow makes us richer. In irrefutable detail, David Limbaugh, like a prosecuting attorney, makes his case that the Obama administration is a real and present danger to America’s future. 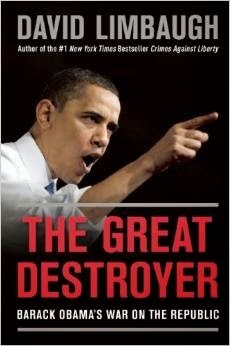 There is no more comprehensive indictment of the Obama administration as it seeks re-election than The Great Destroyer. It is a book that every American worried about the future of our country must read. 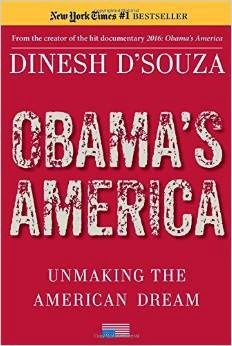 In this #1 New York Times bestselling book, Dinesh D’Souza, the creator of the second highest-grossing political documentary ever, 2016: Obama’s America, lays out Obama’s plans through the end of his second administration and warns us how he will harm the country. America as we know it—wealthy, powerful, assertive—is not what Obama wants. He wants a smaller America, a poorer America, an America unable to exert its will, an America happy to be one power among many, an America in decline so that other nations might rise—all in the name of global fairness. To Obama, the hated “1 percent” isn’t just wealthy Americas; it is America itself. In Obama’s view, America needs to be taken down a notch. That is the startling conclusion of bestselling author Dinesh D’Souza in Obama’s America. Building on his previous New York Times bestseller The Roots of Obama’s Rage—which Newt Gingrich called “stunning…the most profound insight I have read in the last six years”—D’Souza shows how Obama’s goal to downsize America is in plain sight but ignored by everyone. D’Souza lays out what Obama plans to do in a second administration—a makeover of America so drastic that the “shining city on a hill” will become a shantytown in a rather dangerous global village. Arresting in its presentation and sobering in its conclusions, Obama’s America is essential reading for those who want to change America’s course before it’s too late. ObamaScare - Coming soon to a bookstore near you and online! It is worth the wait! More horrific than a Stephen King novel. More scary than icy winter roads in New Hampshire. More scary even than death itself! The imminent death of a once great nation, felled by one anti-American U.S. President! Don't miss this one - we must all rally together for the betterment of our country - not just our own special interests. What value is there to health care, gay marriage, or even free government handouts if we end up living in a socialist dictatorship? Don't think this can happen? Think again!! We are almost there! 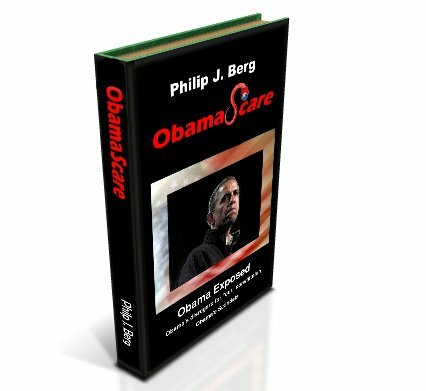 Author Philip J. Berg reveals all in this true and shocking treatise, and backs up all his claims with fact. 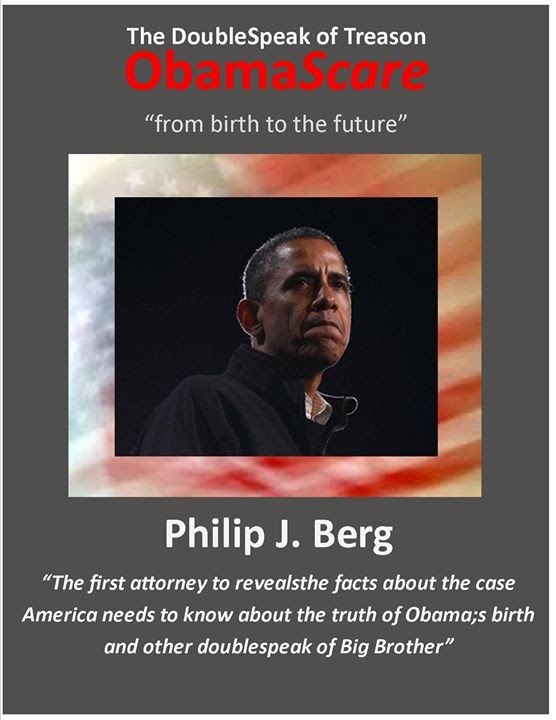 This soon to be released book is a must read for all American citizens, and indeed for all the people of the world. OK, so it is a bit early, and I have not posted recently, but we need a plan to keep Hillary Clinton off the 2016 Presidential ballot. A pawn of the Democratic party, made a martyr during by Barack Obama and a woman to boot, no less. She is Hitler the second and would be even worse than Obama if elected to the office. Sadly, I fear that this will be the ultimate outcome as the Republicans are once again splintered and can't find anyone capable of competing. The sheeple and liberal Hollywood personages (and ultra liberal media and special interest groups) will push her through just because she is uber-liberal and a powerful female figure. Just wonderful reasons to put a person in as President of one of the most powerful countries in the modern world! It’s a lousy bank because after 25 years they are no longer offering you a free checking account. Well, aren’t you special? If you are unable to maintain at least $1500 in your 25-year-old business account then maybe you are not a profitable customer. It’s time to pay for the service. You do not have a valid complaint. Sir, I beg to differ with you, but do appreciate your response. You however are close minded. I am an artist and writer and bring in less than $10,000 per year in these activities. I do it more for enjoyment than for profit, but do sell some of my work. As such, I require a business license, sales tax license AND a business account. It is not my intention to become rich at this, just to be able to sell my works to interested parties. Even the monthly fee would extract too large of a percentage of my profits to make it worthwhile, and I certainly would not want to lock up $1,500 with the bank to avoid a couple of hundred dollars in fees. As for the validity of my business, there are tens of thousands of people in my same situation with a combined net worth greater than the net worth of WalMart (per Entrepreneur Magazine, 2012, can't remember the month.) There are artists, crafts people, musicians, summer carnival vendors, part time caterers and the list just goes on. Best to think before you post such a rash response. My greatest complaint is that these huge businesses, banks included, are always jack-booting the little fellow who is struggling to survive and make a few bucks. They say we are a nuisance to them. I say, why not charge the huge companies that eat up all their server space and take endless hours to support and cut the little guy a break! Thank you SO much PNC! After 25 years of service you they have advised me that they have killed their free business checking and are now charging an unreasonable fee and demanding a huge deposit to maintain checking without this fee!!! I am heading down to theri lousy bank Saturday and cancelling ALL my accounts and switching them to my local bank, First Keystone, who still cares about its customers! I encourage anyone else affected to do the same - let the bank know by the loss of our dollars how much we hate them! Share this with all your friends and spread the word across the world if you think this is unreasonable! Big year elections! Let's pitch the bums that are not voting in OUR best interest! This is the year to vote out all the losers who aren't voting on OUR behalf. Regardless of political party, we need to vote out the losers who favor the big corporations, insurance companies, utilities, home entertainment companies, etc. over us! And, don't vote for someone just because they have ONE of your interests on their agenda! Look at ALL they stand for! Better to sway someone who has our back toward your interests than to have some loser in office who is undermining our society while working hard for one special interest. We now have a Facebook page at http://www.facebook.com/bootthebums. We will be finalizing our plans and setting up our website in the next month or so. Keep posted by "liking" our Facebook page!